Due to new pricing structure we are not allowed to sell this for any lower so grab them while you can. The MA957 is our best selling regulator by far. It can be used with our top of the line CO2 pH controller MC122 so we decided why not make this a real deal with the free shipping. The MA957 CO2 regulator is a quality unit by Milwaukee instruments. It is sturdy, dependable and made to last. This unit comes with a integrated bubble counter, and a solenoid valve for on off cycles. You can also hook this up to a timer. Great for aquariums or hydroponic greenhouse growing of plants. Grab a tank, some tubing and the MA957 regulator and you are all set for a aquarium party. 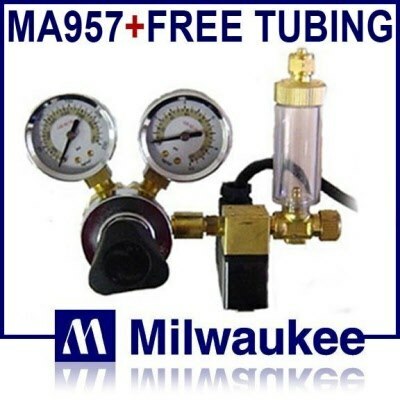 FREE shipping on this Milwaukee CO2 regulator (Cont USA) Free CO2 proof Tubing included as well in this Milwaukee Aquarium regulator gauge sale.